When Mount St. Helens reawakened in late September 2004 with an intense swarm of earthquakes and very noticeable uplift of the volcano’s crater floor, there was great uncertainty as to how the activity would unfold and what style of eruption might result. Would there be a strong explosive eruption similar to the infamous eruption on May 18, 1980, or the subsequent effusion of viscous lava that formed a massive lava dome from 1980 through 1986? 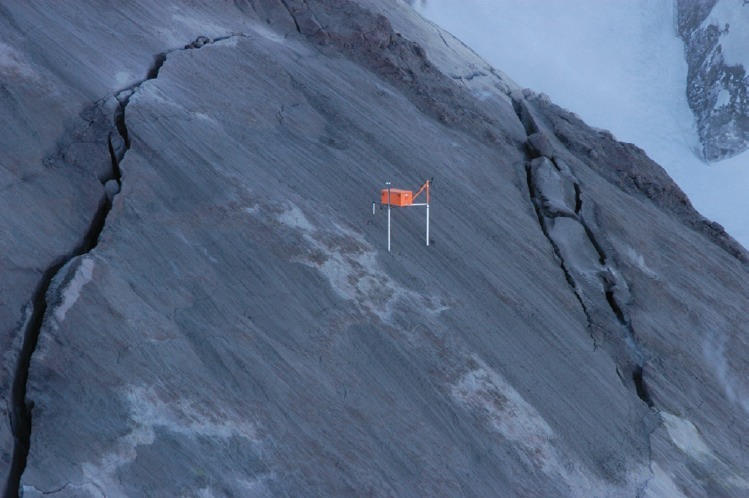 As the activity intensified and monitoring stations in the crater were destroyed by small, steam-driven explosions, scientists at the Cascades Volcano Observatory (CVO) needed to install additional instruments in the crater to better track the earthquakes and ground deformation in real time. The uncertainty and potential for explosive activity, however, meant that the crater was considered extremely hazardous to scientists spending any more than a few minutes there. 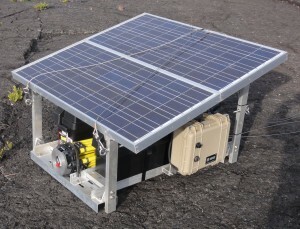 A typical monitoring station for detecting earthquakes or deformation consists of solar panels, batteries, antenna mast, housing for the electronics, and instrument pad or monument. Installing such a station requires multiple helicopter sling loads to the site and tmany hours to assemble by people working on the ground. Then CVO scientists designed and built self-contained, portable units that could be slung into place—and even moved or retrieved—by helicopter, without needing people to work at the site. These units were designed with non-rechargeable batteries to eliminate the solar panels and avoid problems with snow and ice during winter conditions. Nicknamed “spiders” because of their long-legged framework, several were placed on the old dome only 11 days after the start of earthquake activity! The spiders quickly showed that the old dome was moving northward as much as 2 cm (3/4 inch) per day. The massive dome was being shouldered aside by a mass of magma ascending beneath its south side. Lava finally erupted onto the crater floor about a week later and continued erupting through early 2008 to form a new dome nearly equal in volume to the 1980-86 dome. During the 3.5-year eruption, nearly 3 dozen spiders were used to successfully monitor the dome’s activity. Mid-January 2005 photograph of station CDAN GPS spider on extruding spine 4. Legs of differing lengths permitted level deployment on 32° slope. Legs are embedded several centimeters into soft gouge that mantles spine. USGS photo by J.S. Pallister, January 14, 2005. More recently, a portable instrument package was developed at the Hawaiian Volcano Observatory (HVO) to quickly and easily deploy Webcams for recording activity at new eruptive vents and tracking the location and advancement of lava flows in real time. Like spiders, they can be slung by helicopter to remote sites, but they require scientists on the ground to set up the cameras, install and align the radio antennas, and connect the final wiring. Still, the new platforms greatly reduce the time and effort needed to deploy Webcams and other monitoring stations. The core of HVO’s portable unit is an aluminum framework strong enough to be slung by helicopter while also supporting the power system (solar panels and batteries), camera tri-pod, and the electronics needed to acquire, store, and transmit data to the observatory. With the help of a long-term volunteer, Frank Box, HVO now has several of these units ready for deployment when the eruption of Kīlauea changes or activity ramps up at one of the other active volcanoes in Hawai‘i. The pre-fabrication will save many days of preparation time and reduce the number of sling loads needed to quickly install several new, temporary monitoring stations with minimal impact to a site.